We quite often get requests from the community to rework trade routes. We understand the importance of that feature and we’re working on it. Today we would like to introduce small adjustments which soon will be implemented on all game worlds and, as we believe, will make trade routes a bit more convenient for the players. When setting trade route you’ll be able to choose between 2 options – “send at” and “deliver at” to make your deliveries more precise and less dependent on the distance to the target village. You will also be able to set time up to minute when your merchant should start their journey (or arrive to the destination). In the created trade route the “Start” column will be replaced by “Timing” which will show both start and delivery time of your merchants. First servers will get this release already next week (18-24 of February). The feature will be implemented globally by end of February. More detailed rollout plan will be posted in Patch notes section as soon as we know all the details. After the update trade route times might (but not necessary will) be affected and set to wrong minutes. Please, check and edit trade route times accordingly. Keep in mind, that trade setup considers current timezone setting of the account. we are happy to announce that with the next release, another small but highly useful change will be added to Trade routes feature. When you create a new trade route, you will now see a drop-down menu where you will have an option to select an interval with which you want your trade route to be duplicated. 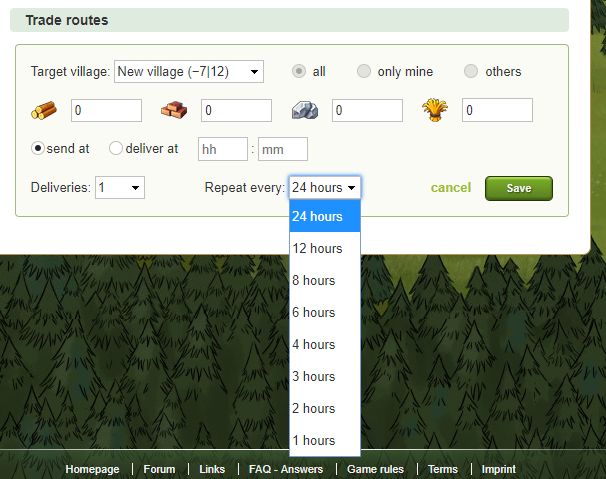 - You set your trade route to start at 04:00, choose 2 deliveries and select "Repeat every 4 hours" and click "Save". - The game will create trade routes with same settings at 04:00, 08:00, 12:00, 16:00, 20:00 and 00:00. 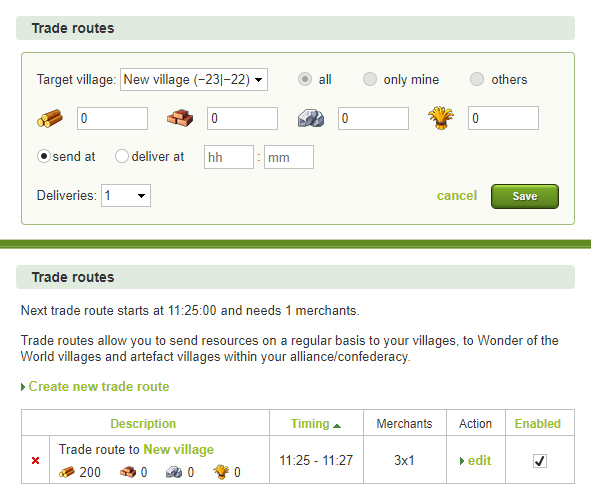 - If you need, you can adjust created trade routes separately by clicking on "edit" button anytime. We believe that this small adjustment will make trade route creating feature more convenient for all of you. The feature will be added to all game worlds during next week (15th - 18th of April, 2019). Post was edited 1 time, last by Stellamini ( Apr 11th 2019 ).